Lighter, finer fabric with a more contemporary fit. Using USA Pre-shrunk cotton. It has a modern, comfortable fit and features a twill collar, double tape placket and rubber buttons. Features a durable 6.5 oz white twill collar stitched with reinforcing tape for added strength. A casual twill placket conceals rubber buttons. Stretch cuffs. Reinforced stitching throughout for added durability. 100% Cotton Jersey, 8oz. 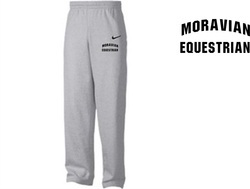 the Nike Core Open Bottom Mens Pants are a fleece pant with side welt pockets and embroidered Nike Swoosh logo at left hip. These pants feature a drawcord waistband for adjustable fit and open bottom hem.